A short entry for a title which we somehow missed over the years, but was flagged up to us by Ross Sillifant. 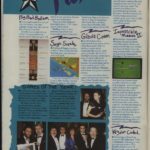 This was an arcade style game which was due on the Spectrum/C64 and ST in June 1988, being mentioned in magazines such as ACE and The Games Machine as coming soon. ACE described the game as being a witch who’s broken faith with your coven, and you must attempt to take power from the twelve covens before All Hallows Eve arrives. Sounds very much like Cauldron! The storyline was written by horror author and C+VG writer, John Gilbert. Sadly though the game seems to have got caught up in the downfall of Piranha, which went down around this time with a bunch of other games. Did anything of this ever get started? Who coded it?